If I had to choose between going to University and not going I definitely would choose to go even if I do end up with huge debts. But for £3000 in tuition fees alone I was sort of hoping for more. The Winchester School of Art said it had a lot of prestige for its arts and textile courses (although it turns out they’re running into problems too) but I wasn’t too worried really, I was more interested in staying closer to home and thought WSA was a safe bet. I didn’t realise when I first got there but the School didn’t have enough space for a new course. To make room for our studio they kicked out the Print Making students and put them in smaller spaces. 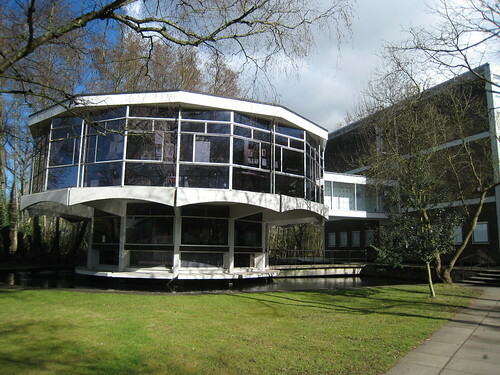 The Rotunda used to be an Art classroom before the first year of the Design course. After finding this out I was trying to figure out where they were going to squeeze in the next year (being a three year course that’s all the room they needed). Well towards the end of the course I heard about WSA’s plans to decentralise the Computers and spread them. Turns out they were going to accomodate the new first years in the Computer room, divide the Computers between each course and set up a ‘professional printing’ service. I’m optimistic because printing was a DIY job before and loads of people kept doing it wrong and slowing things down. It’s the reason I bought my own A3 printer so I could do some slightly larger scale printing myself. Hopefully they’ll do things besides printing such as embossing or foil blocking. For a Design course it was certainly lacking equipment. Only towards the end of the year did we get a big trimmer and block cutter for out studio. Least now we’ll have Computers in our studio, no printers probably but it’s a start. A Laser cutter would be nice too. That’ll do for now, but there’s plenty more for me to say.